I firmly believe that taking a cruise is one of the most enjoyable and budget friendly vacations available. I even wrote about how to take one of these vacations while not spending a fortune in Save Money – Take a Cruise? But cruises aren’t just the mega-ships that usually come to mind, there is a dynamic universe of cruise ships and experiences for all personalities. For simplicity’s sake, I am dividing the cruising universe into two types: Large ship and small ship. I know that there are various iterations and some of the ships I deem small may disagree, but I’m just trying to make the comparisons simple. Everyone is familiar with the large ships; Royal Caribbean, Celebrity, Norwegian, and Carnival are just a few of the large and super sized ships available in all regions of the world, from the Caribbean to Australia. The small ships include river cruise boats and smaller, more expeditionary style vessels. Viking and AMA Waterways are a couple of the river cruise companies and Lindblad is perhaps the best known of the expedition-style small ship. I have cruised on both large and small ships, although admittedly not river boats, and have enjoyed all of my experiences, even though they were markedly different. In spite of the millions of people who take cruises, this vacation is very personal and you have to take into account certain characteristics when deciding which style, large or small ship, is best for you. Here are some tips on finding your own cruise personality. Food – Like it or not, eating is one of the most important aspects of any trip, especially on a cruise. I know everyone jokes about all the food available onboard ships and the never ending buffets, but I’ve never found the food to be excessive. Like anything else, it‘s up to you as to whether or not you indulge to an extreme. Onboard large ships, there are countless options at all times of day. Breakfast is usually enjoyed in the large, buffet style dining room, although complimentary room service is also a great option. Lunch is in a similar setting and if you get peckish throughout the day, the mega ships have scores of options from Johnny Rockets to gourmet cupcakes and yes, there are midnight chocolate buffets. Small ships are different. There is not usually assigned seating, many times all meals are buffet and there aren’t endless eating options; but that’s ok. Frequently, the mega ships are themselves an additional destination, but smaller ships really do highlight the actual destinations more than the ship. That’s not to say the quality isn’t there, it most certainly is. While the ships may be small, they engage talented chefs and offer more unique and forward thinking meals than their mega rivals. There is also usually tea, coffee and some snacks available during the day. On the Lindblad ship Endeavour, the coffees and snacks were in the library which added a certain old world feel to the day. While there aren’t midnight chocolate buffets on these ships, the attention to the guests’ needs is present at all times. Amenities – Modern cruise ships are famous for the onboard activities. 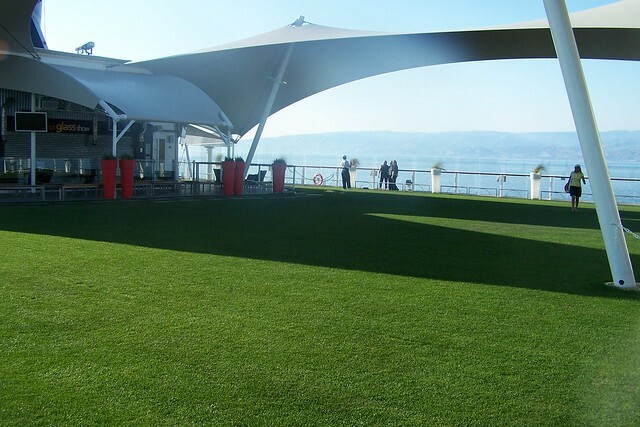 Mega ships have everything from ice rinks to water parks and even real grass with croquet. Different ships tend to specialize in different activities, but there’s no shortage of ways to spend your time. In addition to the fun stuff, there are gyms, casinos, spas and of course seemingly endless bars. Even though small ships are, well, small, they too have plenty of amenities for their guests. While you won’t find an ice rink on board, why do you really need one anyway? They do have everything else one would need including world class gyms, spas and even a bar or two. People – To state the obvious once again, mega ships are large and have thousands of guests on board. While you will absolutely meet new people and perhaps make friends, there is a certain level of detached anonymity available onboard. If you are so inclined, it is very easy to spend an entire week without engaging with anyone new. A lot of people can also mean a lot of confusion and long wait times. You notice the impact of thousands of guests right away during both the embarkation process and the lifeboat drill. During the cruise itself the ships’ crew usually does a good job of managing the crowds until it comes time to visit a port. 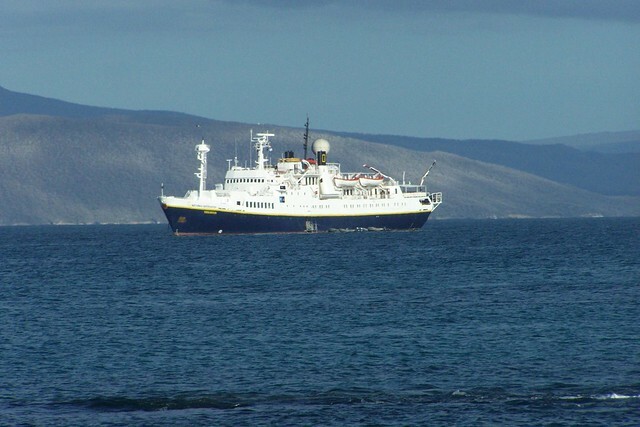 If you are visiting an area where you have to tender (take a small boat) to the mainland, you may have to wait up to an hour to leave the ship. Small ships definitely have the advantage of fewer people. Getting on and off the ship is easy and the crew quickly helps alleviate any bottlenecks that may occur. There is also a forced intimacy due to the size of the ship. You tend to talk to more people and, in my experience, make more friends. Because you aren’t gallivanting off to the next Bingo game or putt putt tournament, there are more opportunities to talk with the other guests and in many times make lifelong friends. Of course, if you don’t like your fellow passengers the trip can be a long one. Oddly enough, cruising is a personal experience and everyone has different preferences. Large ships are great and are themselves a separate destination in addition to the various ports of call. Small ship cruising though is unique and not only gives its passengers an intimate feel, but because of the smaller ship size they can access areas of the world unavailable to the mega ships. Regardless of which you choose, cruising is one of the best vacation options available to anyone of almost any background, age or experience. I like that you divided all the ships into large and small. I think this is a good and simple way to think about all the different ships and experiences available. Lots of choice, but there IS a cruise for everyone.